This disc juxtaposes two significant Russian works for violin and orchestra, each written by a composer with a close relationship to Tchaikovsky, and each dedicated to the great violinist and pedagogue Leopold Auer. These two concertos are both formidable display pieces, designed to show off Auer’s transcendental technique. Ilya Gringolts, acclaimed as one of the great young violin virtuosos of today and lauded for his debut recording on Hyperion, dazzles in this repertoire, ably supported by the BBC Scottish Symphony Orchestra under Ilan Volkov. Arensky’s Violin Concerto is an original single-movement work, cast in contrasting sections. It is a model of the flowering of Russian romantic nationalism—Tchaikovsky’s influence on his friend is pleasingly evident—as is Arensky’s gift for melody and delightful contrasts of musical character. Taneyev’s much larger Suite de concert is a synthesis of different styles: it looks back to the Baroque suite with its different dance movements, the Märchen movement suggesting the high Romanticism of Schumann and the Theme and Variations a homage to Tchaikovsky. Particularly striking is the finale: an energetic and vivacious Tarantella, almost relentless in its onrushing rhythm. As the finale proceeds the dance becomes more frenetic, driving to a viscerally exciting conclusion that must have brought the house down in live performances. This disc juxtaposes two significant Russian works for violin and orchestra, each written by a composer with a close relationship to Tchaikovsky, and each dedicated—as Tchaikovsky’s Violin Concerto had been—to the great violinist and pedagogue Leopold Auer (1845–1930). Though Hungarian by birth, and a pupil of Joseph Joachim, Auer settled in St Petersburg and taught at the Conservatoire there from 1868 to 1917. Thus for well-nigh half a century, until he emigrated to the USA following the Revolution, Auer was one of the principal virtuosi of his instrument in Imperial Russia, one to whom many composers turned to seek technical advice and performing advocacy for their works. 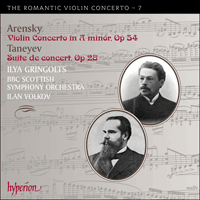 The earlier of the two works on the present disc is the sole violin concerto of Anton Stepanovich Arensky (1861–1906). Arensky was born in Novgorod and, though originally a pupil of Rimsky-Korsakov in St Petersburg, at the age of twenty-one in 1882 he became a Professor at the Moscow Conservatory, where he was closely associated with Tchaikovsky, both in friendship and stylistic emulation: the kinship of Arensky’s musical language to that of the older composer has often been remarked. Among the pupils in his harmony class were Rachmaninov and Scriabin, and like Rachmaninov Arensky composed a work in memory of Tchaikovsky—his Second String Quartet, in which he unusually substituted a second cello for the second violin, probably in order to darken the tone-colour for his elegiac purpose. In the 1890s he returned to St Petersburg as the director of the Imperial Choir, a post for which he had been recommended by Balakirev, but retired from this position in 1901. Arensky died comparatively young, of tuberculosis, in a sanatorium at Perkijarvi, Finland, leaving an output of moderate size of which the best-remembered pieces are undoubtedly the aforementioned quartet and the Variations on a Theme of Tchaikovsky which he extracted from it and scored for string orchestra. Nevertheless, Arensky was a natural and charming melodist, and he wrote several other delightful compositions, of which his Violin Concerto in A minor Op 54 is one of the most notable. The deft and elegant single-movement design of Arensky’s concerto, patently a work of the mature stage of Russian romantic nationalism, contrasts with the more formal, even neoclassical ambitions of the much larger Suite de concert by one of Arensky’s closest associates at the Moscow Conservatory—Tchaikovsky’s protégé, champion and friend Sergei Ivanovich Taneyev. Five years Arensky’s senior, Taneyev was born in 1856 at Vladimir-na-Klyaz’me; his gifts were recognized while he was still a child and he entered the Moscow Conservatory before he was ten, studying composition with Tchaikovsky and piano with Nikolai Rubinstein. In 1875 he graduated from the Conservatoire, the first student to win the gold medal in both performance and composition. Taneyev gave the Moscow premiere of Tchaikovsky’s First Piano Concerto after Rubinstein rejected it, and introduced all of Tchaikovsky’s subsequent works for piano and orchestra. Over the years he took over Tchaikovsky’s and Rubinstein’s classes at the Conservatory and in 1885 was appointed its Director. After four years he resigned the post because of the effects of overwork and in order to concentrate on composition; but he continued to teach counterpoint, his speciality, until 1905. Taneyev’s knowledge of Renaissance counterpoint, including Ockeghem and Lassus, was unequalled in Russia, and he passed it on to his many pupils, who included Glière, Lyapunov, Medtner, Rachmaninov and Scriabin. In the wake of the failed Revolution of 1905, he resigned from the Conservatory in protest at the Director’s punishment of students who had been involved in popular agitation. In his last ten years he resumed his career as a concert pianist, published an important and influential textbook on Invertible Counterpoint and began another on canon. Taneyev was slow to develop as a composer and, while universally respected and admired, remained a solitary figure artistically. He had a strong interest in Russian folk music, but especially as a basis for polyphonic treatment, feeling that Russian music had not yet experienced the polyphonic phase which the rest of Europe had gone through in the sixteenth century. He believed in well-balanced structures and thorough, logical development, tendencies which make him in a sense the most ‘Germanic’ of Russian composers. Not for nothing was he called ‘the Russian Brahms’; yet like his mentor Tchaikovsky he disliked Brahms’s music and proclaimed that Mozart was his ideal. Les deux importantes œuvres russes pour violon et orchestre réunies sur ce disque sont dédiées (tout comme le Concerto pour violon de Tchaïkovski, un musicien auquel leurs auteurs étaient très liés) à Leopold Auer (1845–1930). Bien que hongrois de naissance et élève de Joseph Joachim, Auer enseigna de 1868 à 1917 au Conservatoire de Saint-Pétersbourg, la ville où il s’était installé. Pendant près d’un demi-siècle, donc, jusqu’à son émigration aux Etats-Unis après la Révolution russe, il fut l’un des grands virtuoses de la Russie impériale, auprès de qui maints compositeurs recherchèrent conseils techniques et recommandations interprétatives. La plus ancienne des deux œuvres enreginstrées ici est l’unique concerto pour violon d’Anton Stepanovitch Arenski (1861–1906). Arenski naquit à Novgorod et, s’il fut d’abord élève de Rimsky-Korsakov à Saint-Pétersbourg, il devint, à l’âge de vingt et un ans (1882), professeur au Conservatoire de Moscou, où une forte amitié et une émulation stylistique le lièrent à Tchaïkovski: on a souvent noté la parenté entre sa langue musicale et celle de son aîné. À l’instar de Rachmaninov, qui était avec Scriabine dans sa classe d’harmonie, il composa une œuvre à la mémoire de Tchaïkovski (il s’agit de son Quatuor à cordes no 2), dans laquelle il substitua exceptionnellement un second violoncelle au second violon, possiblement pour obtenir une couleur sonore plus sombre, mieux en phase avec son propos élégiaque. Dans les années 1890, il rentra à Saint-Pétersbourg pour diriger le chœur impérial, un poste pour lequel Balakirev l’avait recommandé mais qu’il quitta en 1901. Mort relativement jeune—il succomba à la tuberculose, au sanatorium finlandais de Perkijarvi—, il laissa une production peu abondante, ses pièces les plus connues étant le quatuor susmentionné et les Variations sur un thème de Tchaïkovski qu’il en tira et qu’il instrumenta pour orchestre à cordes. Reste que ce mélodiste né, charmant, signa aussi de merveilleuses partitions, l’une des plus remarquables étant son Concerto pour violon en la mineur op. 54. L’habile et élégant plan en un mouvement du concerto d’Arenski—à l’évidence une manifestation de la maturité du nationalisme romantique russe—contraste avec les ambitions plus formelles, voire néoclassiques de la Suite de concert, œuvre bien plus vaste de Sergueï Ivanovitch Taneïev, protégé, ami et défenseur de Tchaïkovski. De cinq ans l’aîné d’Arenski, dont il fut un des plus proches associés au Conservatoire de Moscou, Taneïev naquit en 1856 à Vladimir-na-Klyaz’me. Reconnu très tôt pour ses dons musicaux, il n’avait pas dix ans lorsqu’il intégra le Conservatoire de Moscou, étudiant la composition avec Tchaïkovski et le piano avec Nikolaï Rubinstein. Diplômé en 1875, il fut le premier étudiant à remporter la médaille d’or en interprétation et en composition. Il assura la première moscovite du Concerto pour piano no 1 de Tchaïkovski, que Rubinstein avait refusé, et présenta ensuite toutes les œuvres tchaïkovskiennes pour piano et orchestre. Au fil des ans, il reprit les classes de Tchaïkovski et de Rubinstein au Conservatoire, établissement qu’il dirigea à partir de 1885. Quatre ans plus tard, surmené et désireux de se concentrer sur la composition, il quitta ces fonctions mais continua d’enseigner le contrepoint, sa spécialité, jusqu’en 1905. Sa science du contrepoint renaissant, d’Ockeghem et de Lassus, était sans égale en Russie et il la transmit à ses nombreux élèves, dont Glière, Liapounov, Medtner, Rachmaninov et Scriabine. Juste après la Revolution manquée de 1905, il démissionna du Conservatoire pour protester contre la punition infligée par le directeur aux étudiants impliqués dans l’agitation populaire. Dans les dix dernières années de sa vie, il reprit sa carrière de concertiste, publia un important et influent manuel sur le contrepoint réversible et en entama un autre sur le canon. Taneïev mit longtemps à développer ses talents de compositeur et, s’il fut respecté et admiré de tous, il demeura un artiste solitaire. Il s’intéressa beaucoup à la musique folklorique russe, même s’il la concevait surtout comme une base de traitement polyphonique, estimant que la Russie n’avait pas encore expérimenté la phase polyphonique que le reste de l’Europe avait traversée au XVIe siècle. Il croyait aux structures bien équilibrées, au développement fouillé, logique, autant de propensions qui firent de lui, en un sens, le plus «germanique» des compositeurs russes. Ce ne fut pas pour rien qu’on le surnomma «Le Brahms russe», même si, comme son mentor Tchaïkovski, il n’aimait pas la musique brahmsienne, affirmant que Mozart était son idéal. Diese CD stellt zwei bedeutende russische Werke für Violine und Orchester gegenüber, die jeweils von einem Komponisten mit einer engen Beziehung zu Tschaikowsky geschrieben wurden, und—wie Tschaikowskys Violinkonzert—dem großen Geiger und Pädagogen Leopold Auer (1845–1930) gewidmet sind. Obwohl Auer in Ungarn geboren wurde und ein Schüler von Joseph Joachim war, ließ er sich in Sankt Petersburg nieder und unterrichtete dort von 1868 bis 1917 am Konservatorium. Auer war also nahezu ein halbes Jahrhundert lang—bis er nach der Revolution in die USA emigrierte—im zaristischen Russland einer der führenden Virtuosen auf seinem Instrument, an den sich viele Komponisten wandten, wenn sie technische Ratschläge oder Unterstützung für die Aufführung ihrer Werke suchten. Das frühere der beiden Werke auf der vorliegenden CD ist das einzige Violinkonzert von Anton Stepanowitsch Arensky (1861–1906). Arensky wurde in Nowgorod geboren, und obwohl er ursprünglich ein Schüler von Rimskij-Korsakow in Sankt Petersburg war, wurde er 1882 Professor am Moskauer Konservatorium, wo er sowohl freundschaftlich als auch in seiner stilistischen Entwicklung eng mit Tschaikowsky assoziiert war: die Verwandtschaft von Arenskys Musiksprache mit der des älteren Komponisten wurde oft bemerkt. Zu den Schülern in seiner Kompositionsklasse gehörten Rachmaninow und Skrjabin, und wie Rachmaninow komponierte auch Arensky ein Werk zum Andenken an Tschaikowky—sein zweites Streichquartett, in der ungewöhnlichen Besetzung mit einem zweiten Cello an Stelle der zweiten Violine, womöglich, um diesem elegischen Werk eine dunklere Klangfarbe zu verleihen. In den 1890er Jahren kehrte er auf Empfehlung von Balakirew als Direktor der Kaiserlichen Hofsängerkapelle nach Sankt Petersburg zurück, trat 1901 aber von dieser Position zurück. Arensky starb relativ jung, an Tuberkulose, in einem Sanatorium in Perkjärvi in Finnland und hinterließ ein bescheidenes Œuvre, dessen bekannteste Stücke das bereits erwähnte Quartett und die Variationen über ein Thema von Tschaikowsky sind, das er daraus extrahierte und für Streichorchester bearbeitete. Arensky war jedoch ein natürlicher und reizvoller Melodiker und schrieb mehrere andere bezaubernde Kompositionen, unter denen das Violinkonzert in a-moll op. 54 eines der bemerkenwertesten ist. Die gewandte, elegante Satzanlage in Arenskys Konzert, ein offensichtliches Werk aus der Reifezeit des russischen romantischen Nationalismus steht im Kontrast zu den förmlicheren, sogar neoklassischen Ambitionen der wesentlich größeren Suite de concert von Sergei Iwanowitsch Tanejew, einem seiner engsten Mitarbeiter am Moskauer Konservatorium und Tschaikowskys Protégé, Verfechter und Freund. Tanejew war fünf Jahre älter als Arensky und wurde 1856 im russischen Wladimir-Distrikt geboren; sein Talent wurde bereits im Kindesalter entdeckt, und er trat schon vor seinem zehnten Lebenjahr ins Moskauer Konservatorium ein, wo er Komposition bei Tschaikowsky und Klavier bei Nikolai Rubinstein studierte. 1875 graduierte er als erster Student mit einer Goldmedaille in Komposition sowie Interpretation. Tanejew gab die Moskauer Premiere von Tschaikowskys Erstem Klavierkonzert nachdem Rubinstein sie ablehnte und stellte alle folgenden Werke Tschaikowskys für Klavier und Orchester vor. Im Lauf der Jahre übernahm er Tschaikowskys und Rubinsteins Klassen im Konservatorium und wurde 1885 als sein Direktor berufen. Nach vier Jahren trat er wegen Überarbeitung zurück, um sich aufs Komponieren zu konzentrieren, unterrichtete aber noch bis 1905 auf seinem Spezialgebiet Kontrapunkt weiter. Tanejews Kenntnis und Einsicht in den Kontrapunkt der Renaissance, einschließlich Ockeghem und Lassus, das er seinen vielen Studenten—einschließlich Glière, Ljapunow, Medtner, Rachmaninow und Skrjabin—vermittelte, war in Russland unübertroffen. Nach der fehlgeschlagenen Revolution von 1905 trat er im Protest über die Bestrafung des Direktors der Studenten, die am Volksaufstand beteiligt waren, zurück. In seinen letzten zehn Jahren nahm er seine Karriere als Konzertpianist wieder auf, veröffentlichte ein bedeutendes und einflussreiches Textbuch über mehrfachen Kontrapunkt und begann ein weiteres über Kanon. Tanejews Entwicklung als Komponist ging langsam voran und obwohl er allgemein respektiert und bewundert wurde, blieb er künstlerisch eine einsame Figur. Er hatte ein starkes Interesse an russischer Volksmusik, besonders als Basis für polyphone Behandlung, da er der Ansicht war, dass Russland die polyphone Phase, die der Rest Europas im 16. Jahrhundert erlebt hatte, noch nicht erfahren hatte. Er glaubte an wohl ausgewogene Strukturen und gründliche, logische Verarbeitung, Tendenzen, die ihn in gewissem Sinne zu einem der „deutschesten“ russischen Komponisten machten. Nicht umsonst nannte man ihn den „russischen Brahms“, doch wie sein Mentor Tschaikowsky mochte er Brahms’ Musik nicht und erklärte Mozart als sein Ideal.